This open plan and spacious villa is stylishly furnished and surrounded by a charming and private walled in garden. All of the rooms have air-conditioning and mosquito screens on the windows. Bedroom 1 has a king size bed and stunning views from a private balcony. Bedroom 2 has a double bed, en-suite and another private balcony. Bedroom 3 has a double bed, single bed and a double sofa bed. Cleaners are available for cleaning and laundry weekly. Any extra cleaning would be at an additional cost. Set amongst gorgeous gardens complete with a private kidney shaped swimming pool, sun loungers and chairs, the exterior of the villa offers plenty of areas for relaxing from the outside patio dining area on the kitchen terrace to the two roof terraces and private balconies. The pool and sun terraces are maintained on a daily basis however in the winter months from November to April the pool is closed for cleaning and maintenance unless required, at an additional cost. A large swinging chair with sun canopy nestled in the corner of the garden is ideal for a lazing away the afternoon. 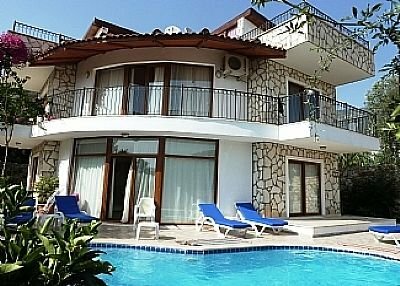 The villa is set in a peaceful location only 10 minutes walk to town of Kalkan which an enchanting, historic town is offering all the charm of an unspoiled haven with its lush nature, brilliant blue crystal-clear sea, historic architecture, ancient history and warm traditional Turkish hospitality. The nearest beach to the villa is in Kalkan town which is approx. a 5 minute drive. The local travel agency offers tours and trips such as jeep safari, scuba diving, boat trips and horse riding. There is also a private beach which has no sand but is rocky and has a small jetty. The largest beach, Patara is approx. 20 minutes drive by taxi or local buses which would be approx. 25 mins. The local shop to the villa is a very short walk and offers all the basic essentials. The village of Kas is only 30 mins by car, with stunning views along the coastline drive, where ruins of the ancient town of Antiphellus mix with modern buildings. Kas is also a good base for exploring the plentiful ancient Lycian cities and archaeological sites such as Demre (Kale), Patara, Xanthos (Kinik), Letoön, Saklikent and Tlos and across the water to the south lies the Greek island of Megisti. Transfers to and from the airport can be arranged at an additional cost. Although this is a non smoking villa smoking is permitted outside using ash trays.There is also a pushchair and car seat if required. Two double blow up air beds are available if required. A rolling cart cool bag and some inflatable toys for the children also available.